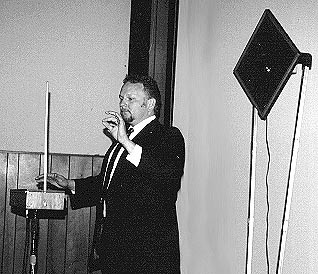 On Sunday, March 3, 1996, the Ojai Film Society presented the intriguing documentary Theremin: An Electronic Odyssey by Steven M. Martin. 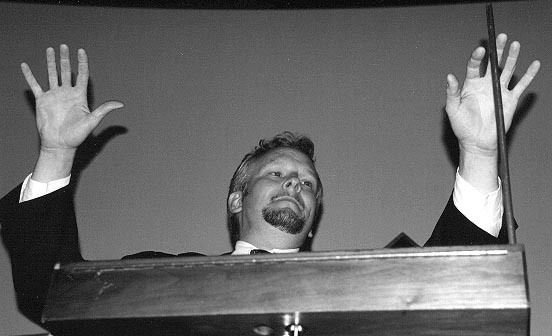 The capacity audience of about 250 patrons thoroughly enjoyed the show. A question-and-answer session followed, with the audience apparently trying to throw every heterodyning curve they could think of! Seriously, we all had a very enjoyable time at the theater, followed by an excellent dinner at a local restaurant. Steve Grumette brought along his Paia Theremax and set it up in the dining room. 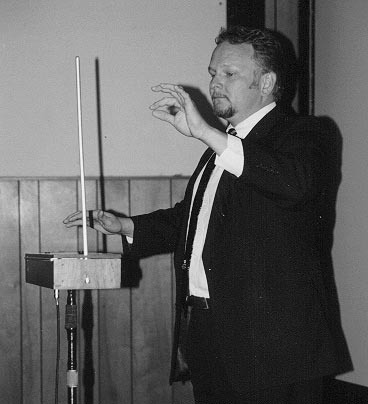 Dinner patrons took turns at the instrument, to the delight of the theremin-enthusiasts in attendance. The restaurant staff did not seem quite as intrigued, however...! The Ventura County Star ran a great article by staff reporter Rita Moran on Friday, March 1, 1996. The cover of Time Out, the entertainment section of the paper, featured the films poster graphic; and the excellent and in-depth article ran across the two center pages plus part of a third page. Ms. Moran really did her homework, interviewing Steve Martin, Paul Shure, and ... me! Copies of this issue can be obtained from the Star by calling 805-650-2900. I am very grateful to Steve Grumette and Martha Jaffe of the Ojai Film Society for inviting me to perform for them. And I want to thank Marthas husband, Peter, for taking photos and sending me copies. Following are four pictures from the concert. Click on the thumbnail pictures for full-size versions. You can also see the special loop volume antenna with which this Moog Melodia theremin has been fitted, instead of the flat-plate antenna originally mounted on the outer end of the wood cabinet. If you want more information on the construction of the antenna, drop me an email. The loop antenna helps tremendously, especially when shaping phrases and playing staccato. 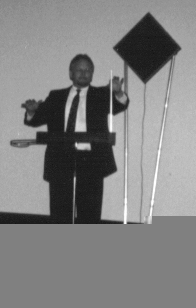 You will also note that this instrument has been modified for left-handed pitch control and right-hand volume control. A little closer in, getting a better look at the speaker. Yes, the tubing for the speaker stand is made of vacuum cleaner wands! Theyre perfect  made of lightweight aluminum, they break down into eight sections for easy storing and transporting. Well, thats about it. Thanks for stopping by! (Please note that all text and some images* are copyright © 2001 by Charles Richard Lester. You are welcome to disseminate information or graphics from this web page for non-commercial use only but only after requesting  and receiving  permission by its author (me). Please apply to Charles Richard Lester: one_three_sevenat1377731.com (change "at" to the "@" symbol). Thank you for appreciating the value of creativity.